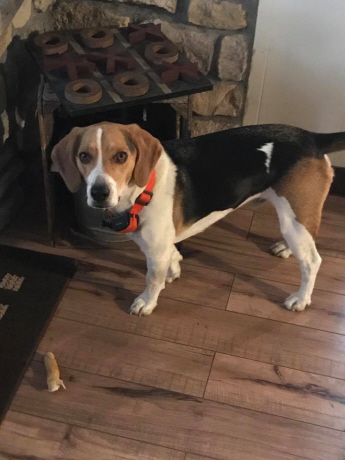 Hank is a sweet beagle boy who loves giving kisses and being close to us at all times. He loves sitting on our laps or curling up alongside one of us, and it’s clear that he didn’t receive much, if any, human attention before coming to us. 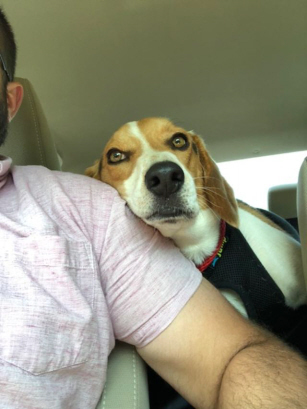 Because of this, Hank is working through some separation anxiety, and would do best in a home where he won’t be alone for long hours at a time. 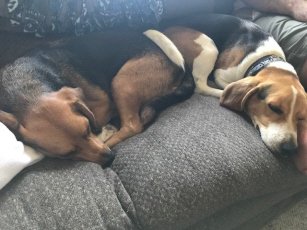 Hank does wonderfully with his foster beagle brother, and they can often be spotted napping together. So far, Hank has also interacted well with the other dogs in our building and at the dog park, and he has not displayed any signs of aggression or dominance. 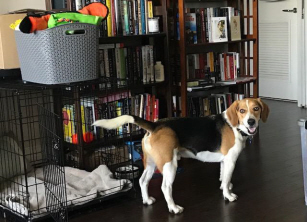 We’ve only heard him arooo once out of excitement, but doesn’t make a peep when he hears the typical sounds of apartment living. 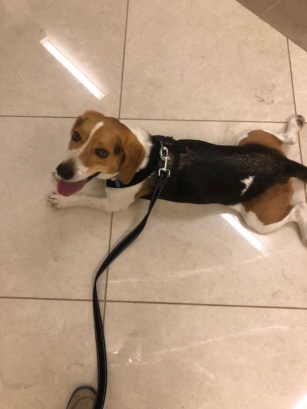 Unlike the average beagle, Hank is not very food motivated and has yet to eat most of the variety of treats we have offered him. He does eat his meals, however, but not always right away. He does enjoy a Kong filled with a little bit of plain Greek yogurt. Hank seems to be crate trained; however, being crated does make him pant nervously. 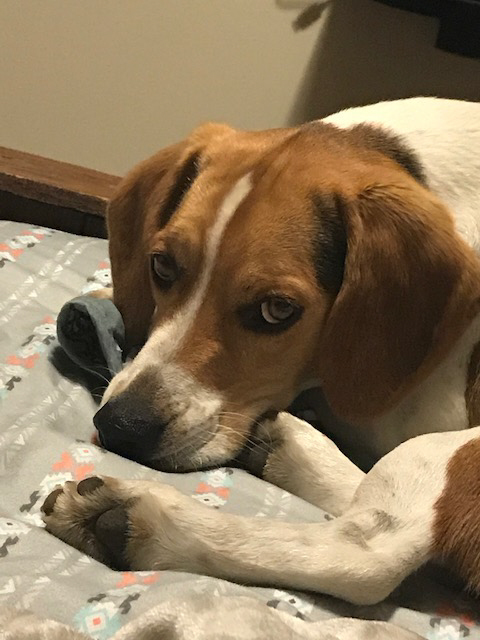 We initially considered crating him at night, but Hank has proven trustworthy and has taken just fine to sleeping in the bed with the humans and his foster brother. Despite his rural beginnings, Hank adapted quickly to living in a city. He does get spooked by sudden noises from time to time, including the washing machine, vacuum and trash trucks. Hank has lots of energy when we’re out and about, but once we’re back inside, he’s happy to stretch out on the couch and relax for hours. He is very laid back, especially given his young age, and has shown no interest in chewing or destructing. He is athletic, and can easily stand up and reach the top of our kitchen counters, so it’s important to keep all human food far out of his reach. Update: Hank has started to enjoy treats more, but is still a little picky (definitely not a plain milkbone fan). He also takes his time to eat breakfast, usually leaving it for an hour or two, but he eats dinner right away. He’s incredibly friendly and sweet, and really loves being close to his humans. We’ve only heard him bark a couple of times, both times were outside. He’s very quiet, and even his whine is muted and more of a whisper. He does whine when he needs to go outside. He’s good with children and doesn’t mind if they pet him at all. He’s also fairly low energy and is happy with a few medium length walks a day or one big trip to the park. We haven’t seen him do a single zoomie yet, and he usually just stands and sniffs in our fenced-in area. He does great with other dogs, although he’s not really interested in playing with them at the park. He’s house-trained, leash-trained (with the occasional tug, hoping to meet other dogs) and crate-trained. We usually put him in the crate before leaving him alone for more than 30 minutes as he does have some separation anxiety. That has definitely eased quite a bit since we first brought him home. We’ve been putting him in a thundershirt fairly often because he does get spooked easily by loud noises and thunder. The shirt has helped a lot, so I’d definitely recommend that to any potential homes for him. We’re still working on him in terms of getting to close and begging when we eat. At first, he’d get in your face and drool while you ate. Now, he no longer drool and will stare from a little further away. .